I want to hold off on doing a true review until I've read all three, but, I can absolutely tell you that I adore the world that Melissa Grey has created, and the main character, Echo reminds me in the best ways of Karu from the Daughter of Smoke and Bone trilogy by Laini Taylor. Both are strong if somewhat reluctant warriors with difficult childhoods who find family and conflict with magical creatures. If you're looking for some great magical realism, creature mythology, adventure, and complicated romance, dive right in because the first two novels have it all. 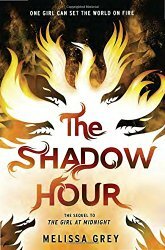 I was so enthralled by this world and its inhabitants it was difficult to pick up a new book when I had finished The Shadow Hour. I wanted to stay in Echo's world, and find out what happens next for her, and her friends. 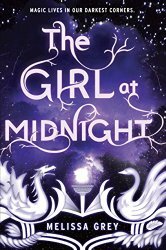 At $1.99, ordering the ebook of The Girl at Midnight is really a no brainer. Less than a coffee at your local cafe, and all kinds of fun and adventure in return!